Bank Accessories, Deposit Slips, etc. NAPA TRACS has partnered with National Document Solutions LLC to create a one stop site for all your shop's lube sticker needs. We work closely with NAPA TRACS to ensure our high quality products are tested and compatible with your TRACS software program. Our prices are competitive and we guarantee our products to be worry free or we will cheerfully offer you a full refund. Thank you for visiting the NAPA TRACS / Bolt On Technology website. If you have any questions before ordering please call TRACS support at 800-742-3578 for clarification. 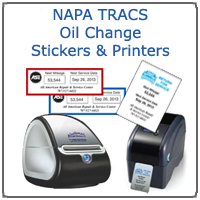 A subscription to NAPA TRACS and Bolt On Technology Pro Pack is required to use the oil change label printer functionality. Call your NAPA TRACS rep or 800-659-3710 for complete details and pricing. Preprinted forms fold faster more easily, saving time! Preprinted forms use less toner/ink resulting in substantial savings! Preprinted forms print 3-5 times faster! Preprinted forms greatly reduce printer wear and tear! Professionally represent you and your shop to your customers!